I've been involved in many projects lately, but my favorite, by far, has been "Fistful of Rupees," a production by The Game Station/Maker Studios. It will be a 3-part mini web series debuting August 7th on TGS's YouTube channel. "Fistful of Rupees" is part of a new, ongoing project called MASHUP, where TGS is taking popular video games and mixing them with a movie genre. In this case, we're turning The Legend of Zelda into a spaghetti western. Think "The Good, The Bad, and The Ugly" but with Link, Zelda, and Ganon instead of Clint Eastwood and those two sweaty guys. I was honored with the part of Princess Zelda, with popular YouTube stars taking on the other main roles: TJ Smith as Link, Rawn Erickson as Colonel Ganon, and Dodger Leigh as Navi, with directors Nathan Kitada and Aaron Umetani. After seeing the rough cut of the show, I can honestly say each performance is very strong and the shots look fabulous-I'm so proud to be a part of it. I wish I had more to show you; the above set pics are just a small taste of what's to come! 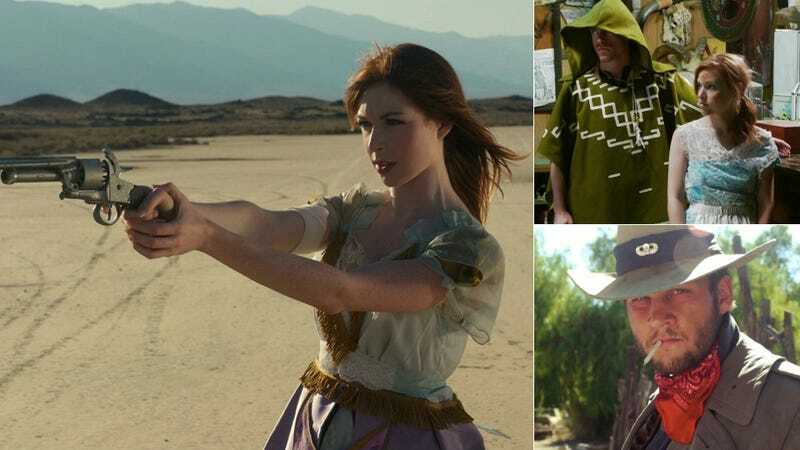 The entire cast and crew put their hearts and souls into this production, surviving shooting days in the middle of the desert in over 100-degree weather. We know you'll love the show as much as we loved making it. Be sure to keep this on your radar and tune into The Game Station's YouTube channel when it debuts! Thank you so much to everyone who tuned into my Kotaku Presents for the last four weeks. I've had such a blast sharing my quirky view of video games with you. Please hit me up on Twitter and Facebook if you'd like to chat, share stupid videos, and keep up with all of my crazy projects. Game on!